Researchers in the Applied Physics Lab and Department of Atmospheric Sciences are leaders in the development of numerical sea ice models used in forecasts on daily to seasonal timescales. See the Polar Science Center’s PIOMAS (Pan-Arctic Ice-Ocean Modeling and Assimilation System) web site. Drilling and analysis of ice cores to obtain information about past climate variability in the Antarctic and in Greenland. Faculty and students in Earth and Space Sciences were an integral part of the recently-completed WAIS Divide ice core, the longest highest relation record of climate every obtained in the Southern Hemisphere. See their recent paper in Nature. 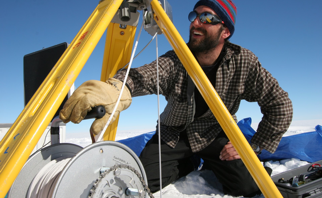 UW researchers are also part of a multi-University program to lead the next major ice core project at the South Pole. See also the Glaciology program’s web site. Faculty in the School of Oceanography are world leaders in the biology of sea ice, the dynamics of high latitudes oceans, and in the development of ocean observing systems such as the autonomous underwater gliders.